DESCRIPTION: Our goal at Nothing to It! is for you to cook well and cook often. That’s why the series wouldn’t be complete without exploring the quintessential “fast food” cuisines- Italian and Mediterranean. These cuisines marry great ingredients and techniques in an elegant and simple fashion. 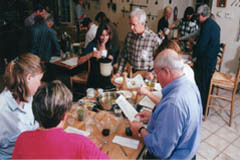 Gain a deeper understanding of advanced culinary techniques, such as roasting and boning knife skills. We'll also start with a cheese tasting to explore cheese varieties and how to incorporate them into your meals and entertaining.